Why Do We As A Culture Hand Our Children’s Teeth To A Strange Freak Fairy? Each week, Weird Things’ own Matt Finley breaks down one of the oddest elements of our culture in a feature we call Monster Of The Week. This week we focus on the Tooth Fairy, come back Wednesday and Friday for more! More than just the story of a shrewd harpy with brimming coffers and an inexplicable calcium fetish, the legend of the tooth fairy is a tale of a Western superstition’s complete 180 degree turn from paranoid delusion to celebratory rite (I’m ignoring the recent additional 10-degree nudge toward Dwayne Johnson-helmed cinematic atrocity). But before we take a look at the wand-assisted incisor seizure perpetrated by she of the glittery wings and deep pockets, we need to look at baby teeth. Now they’re commodities, but back in the olden days, the exchange rate wasn’t so favorable. Today an exfoliated molar might fetch you a couple dollars; a few hundred years ago, the best you could hope was to not be fatally hexed by dark magicks. To lay a wicked pox on someone’s house, all a witch needs is a sample of the victim’s DNA and some elbow grease (preferably that of a middle-order demon, notorious as they are for their excessively greasy elbows). Or, at least, such was the belief of many ancient civilizations, who devised all manner of creative disposal methods for nail clippings, hair sheerings and disenjawed teeth. Hair and nails (along with samples of urine and menstrual blood) were often relegated to hidden witch bottles – ceramic or wooden vessels that, when intact, protected the owner against naughty mojo. Meanwhile, baby teeth were disposed of by a variety of regionally variant means, including burying, burning and swallowing. 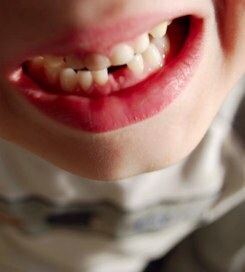 Some folks even tossed the derelict chompers into rats’ nests because, as you probably already know, if a mouse or a rat gnaws on a child’s lost milk tooth, the child’s permanent teeth will grow in healthy and strong. Posted in Fairy, Monster Of The Week | Comments Off on Why Do We As A Culture Hand Our Children’s Teeth To A Strange Freak Fairy? This week, Weird Thing Culture Reporter Matt Finley takes a look at the Homunculus, a strange idea that survived against reason and logic. Monday we looked at how long the idea has been around. Wednesday we found out how science got past the idea of little naked men ruling our lives. The flaw in this notion is that if a person requires an internal homunculus proxy to perceive the world, it follows that said homunculus must rely on its own even tinier, more disgusting homunculus proxy. And so on. This conceptual roadblock is known as infinite regression, and it represents, among other things, the intersection between homunculi in science and homunculi in philosophy. Divorced from unsettling, naked men, infinite regress is still a popular philosophical rejoinder, especially during disputes about consciousness. One classic (though woefully out-dated) philosophical argument about the nature of human consciousness is Descartes notion of dualism (AKA the mind-body problem) – that the mind is non-physical entity separate from the material brain. Descartes even identified the pineal gland as the area of the brain where this immaterial vapor soul thing resided. Cognitive science has since discredited this notion, leaving philosophers to reconstruct an entirely new model of human consciousness. Lo, gaze yonder! The homunculi are returning! And contemporary American philosopher Daniel Dennett is carrying them in an adorable papoose. Dennett is extremely concerned that, even as philosophers attempt to divorce themselves from the long-standing notions of Cartesian dualism, its ghost haunts even the most logical materialist argument. He calls this effect Cartesian materialism, and basically argues that if you take Descartes’ intangible mind and regard it as physical, but still approach the mind and brain as separate material entities, the newly tangible mind entity becomes, in essence, a homunculus, perched back up inside the human head for the first time since that whole vision debacle, absorbing stimuli and whispering analyses into the cortex. And if that little guy’s up there functioning as our consciousness, then he himself is conscious and must have… well, you know the drill. Ever Wondered Who Bloody Mary Really Was? Bloody Mary is the Monster of the Week! Matt Finley explained some of the ghastly woman’s other talents on Monday. Wednesday he explained exactly why you’ve been hoodwinked into calling her out all these years..
With all the varying verbal harpoons fired out into the ether to drag Bloody Mary back into the living world, it’s easy to forget that, though the current urban legend has been disassembled and reconfigured, often to the point of unrecognizability, the first fearful, double-dog-dared invocations of Bloody Mary were spoken with Mary I of England in mind. Mary I (not to be confused with Queen Mary of the Scots, who is often wrongly identified as the crotchety mirror-dwelling apparition) was the only child of Henry VIII’s first wife, Catharine of Aragorn, to survive into adulthood. Despite being unfavored and disregarded by her family, she received the crown in 1553 after her half-brother Edward died of tuberculosis. Bloody Mary went on to earn her macabre epithet when, after officially restoring Roman Catholicism to Great Britain, she began rounding up Protestant leaders and burning them at the stake, igniting a flurry of religious riots and violence. 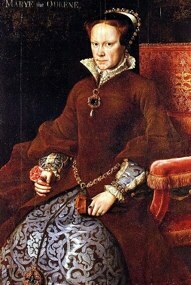 The most enduring modern connection to the story is any variant of the game in which summoners must speak the words, “Bloody Mary, I killed your child”- Mary I became so obsessed with producing a male heir that she endured two phantom pregnancies, during which she firmly believed she was carrying a child that was then somehow miscarried or aborted. Generalizing for purposes of brevity, the origins of Bloody Mary as a Protestant horror story belie the deeper history of both a uniquely Protestant fascination with the occult and a trend of propagandized anti-Catholic gothic literature. Unlike most 16th century Catholics, whose faith was entrenched in dogma, hierarchy, tradition and ritual, many Protestants, especially in Ireland, believed in ghosts and superstitiously permitted the occult to fill in certain gaps that existed in the post-enlightenment thought that Protestantism so thoroughly embraced. Beyond assigning Mary I her now-infamous soubriquet (despite the fact that, in reality, the queen didn’t execute any more people than her Protestant father), the Protestants were later known for distributing pulp novellas that portrayed convents as dark caverns of orgiastic chaos with priests travelling through underground tunnels to engage in violent fornication with nuns, yielding innumerable illegitimate children that were then disposed of by horrific means. Given these factors, it’s easy to understand how a violent, Catholic threat to the Protestant faith was transformed into a vengeful specter – a zombified appendage of history reaching out at the giggling great grandchildren of unjustly murdered Anglicans. Posted in Monster Of The Week | Comments Off on Ever Wondered Who Bloody Mary Really Was? For decades, the Nain Rouge leap-frogged one disaster to the next, always arriving in time to pre-empt tragedy with some goggle-eyed nose thumbing before evaporating into the high drone of an emergency broadcast signal, and for decades, from one disaster to the next, Detroit marshaled and rallied and summoned hope up out of the ashes and bones of the city’s past. In July of 1967, everything changed. What should have a been a routine raid on an illegal bar turned into a five day riot that ended with the deployment of National Guard and U.S. Army troops. 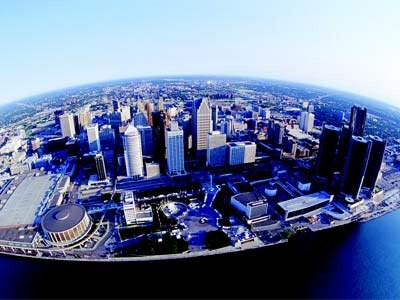 Fueled by festering racial tensions that were only exacerbated when the Detroit police, a source of friction to begin with, started making mass arrests, the riot surprised the entire country – urban living statistics coming out of Detroit portrayed it as a diverse, racially integrated wonderland. (Ultimately, the fault didn’t lie in the numbers, but in rampant, unquantified everyday prejudice, including frequent racially based mistreatment of consumers by local merchants.) In the wake of the confrontation, which was supposedly preceded by several chortling visits from the hyperactive Nain Rouge, even the most adept statistician couldn’t argue with the 43 deaths, 467 reported injuries, 7,200 arrests and more than 2,000 immolated buildings. Like a wounded, shell-shocked Veteran, the city never fully recovered. The crime rate skyrocketed in the 1970s and the town’s social fabric unraveled. Through much of the decline, the cheeky red gnome didn’t issue so much as a somber Bronx cheer. For more than two and half centuries, the Nain Rouge seemed conjoined to the city, genetically tethered to it by a thin band of fiction, sharing whatever municipal organ secretes narrative dopamine in the wake of urban injury. But it’s hard to define the identity, the personhood, of a city. It lives in constant symbiosis with its citizens and the culture they mold and consume and re-mold, defining the place as it, in turn, defines them. The Nain Rouge was an identifying aspect of Detroit since its founding, a lodestone of a socio-cultural foundation that many believe to have crumbled in 1967. After the riots, local and state government banded together to form a committee meant to revitalize – to redefine – the city. In defiance of history, they called the group “New Detroit.” In the last three decades, only a single Nain Rouge sighting has been reported. You are currently browsing the archives for the Monster Of The Week category.